There are health benefits to summer squash which makes eating this vegetable a little more tolerable. Squash is low in calories and fills you up–a nice benefit. Squash supplies Vitamin C and B-complex vitamins and the colorful skins are rich in antioxidants including the carotenoids lutein and zeaxanthin. These phytochemicals are being studied for their action in helping prevent chronic diseases. Squash contains fiber, especially pectin–a type of fiber being studied because of its ability to provide protection against diabetes and better regulation of insulin. So when you eat squash there is some surprising nutritional value, too. I always thought that spring was the time to plant summer squash in a Louisiana garden. 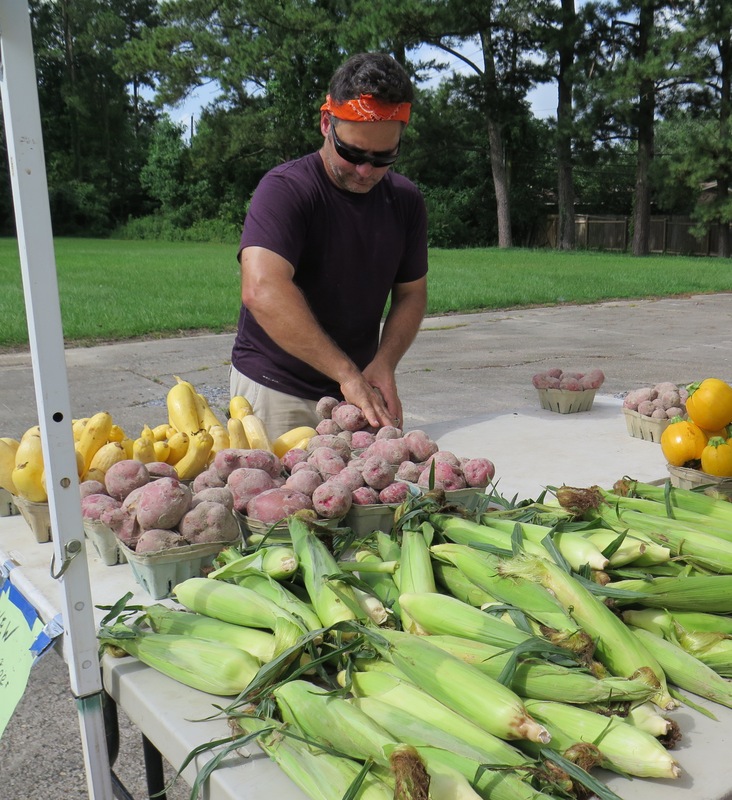 But this summer I have been stopping by a satellite farmer’s market on Tuesdays. One of the farmers from Ponchatula made a remark that he grows a fall crop of summer squash and cantaloupes, planting them in July. I figured if he could grow them — so could I. The above photo shows the summer squash and zucchini that I grew. Not bad for me! Below is the vegetable farmer from Ponchatula; I like to support local farmers and appreciate a fresh supply of produce. 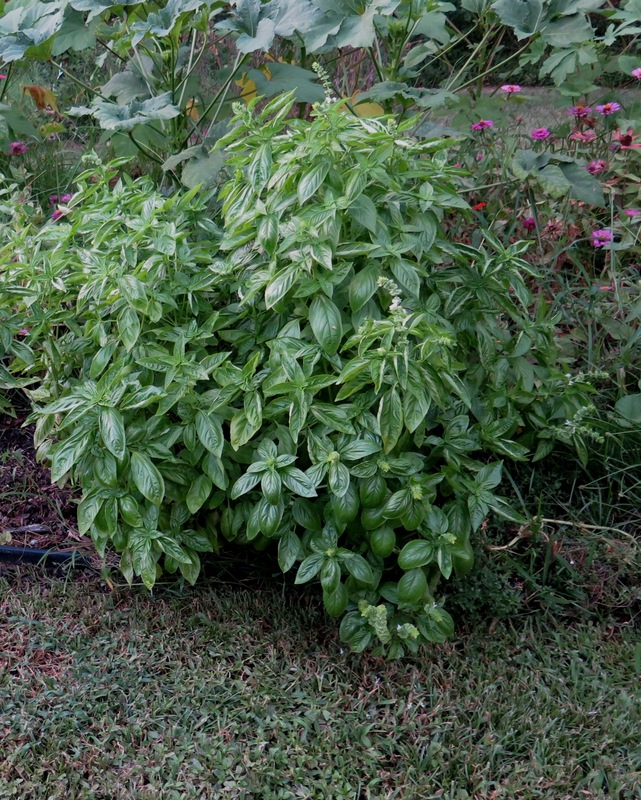 Basil is an annual–which means it only grows for only one season and must be re-planted every year. But fortunately, basil is easy to grow. I spread the tiny seeds over the ground and they all spout. One little seed packet yields alot of basil. The plants don’t require much attention–I just leave them alone and they continue to grow through the droughts and the pouring rain. When basil flowers, just pinch off the flowers and they make more stalks! I always need ways to use basil; fresh basil pesto is one idea. 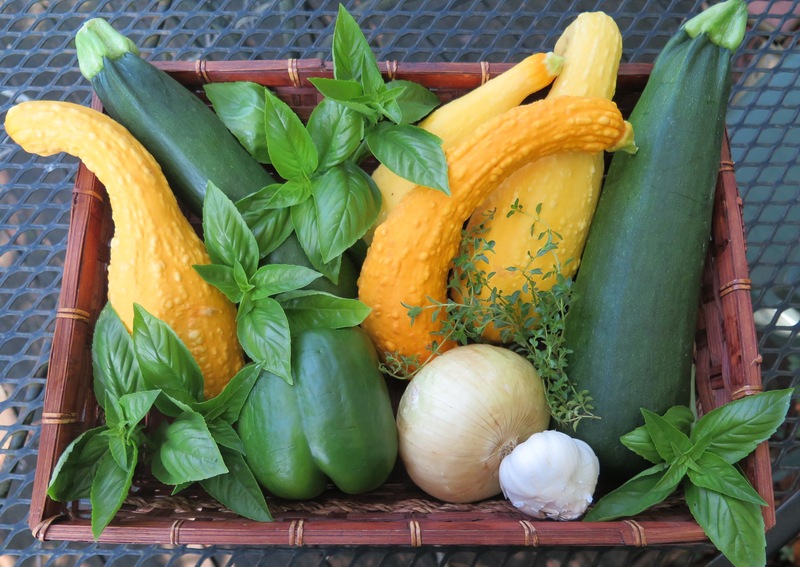 But basil makes a nice flavor addition for other foods, too; it pairs nicely with summer squash in these two recipes. 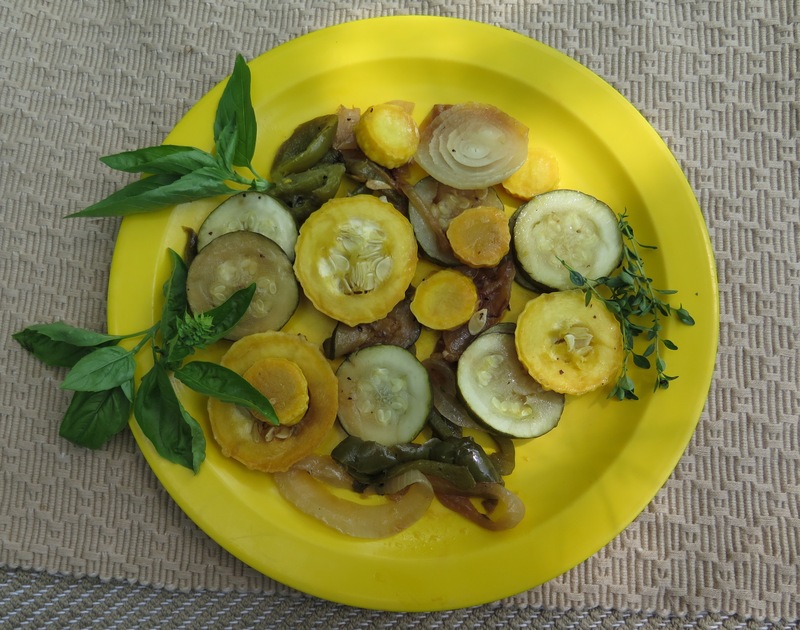 Both the recipes are stir-fry or steamed squash recipes.The seasoning ingredients–onions, bell peppers, basil, pepper–to add to the flavor as squash is rather bland. 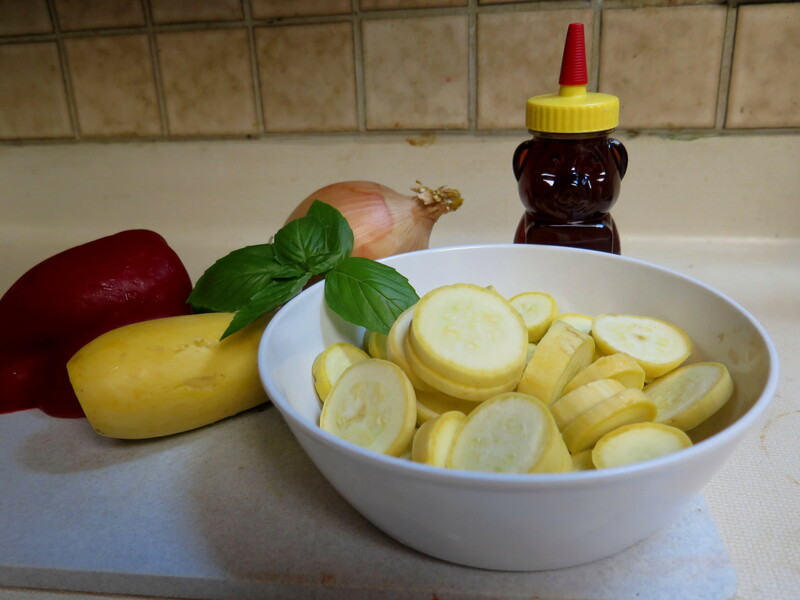 One summer squash medley has a sweet flavor with the addition of honey. I was a little skeptical, but it is quite nice. 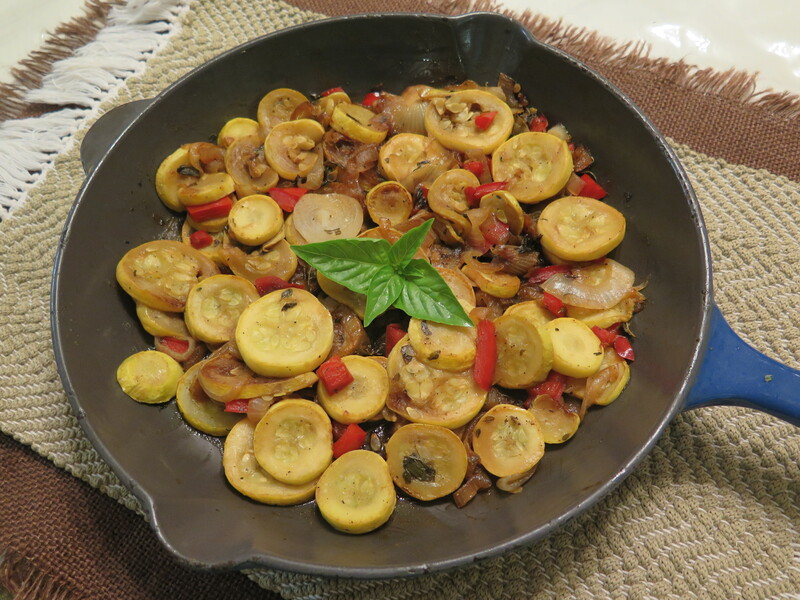 The second squash medley is almost the same; it uses both yellow squash and zucchini. It has a sour taste with the addition of a little vinegar; I really like the sour taste–try it! I use a heavy cast-iron coated skillet to prepare these dishes. Saute the onions in margarine, adding bell peppers and garlic (optional). 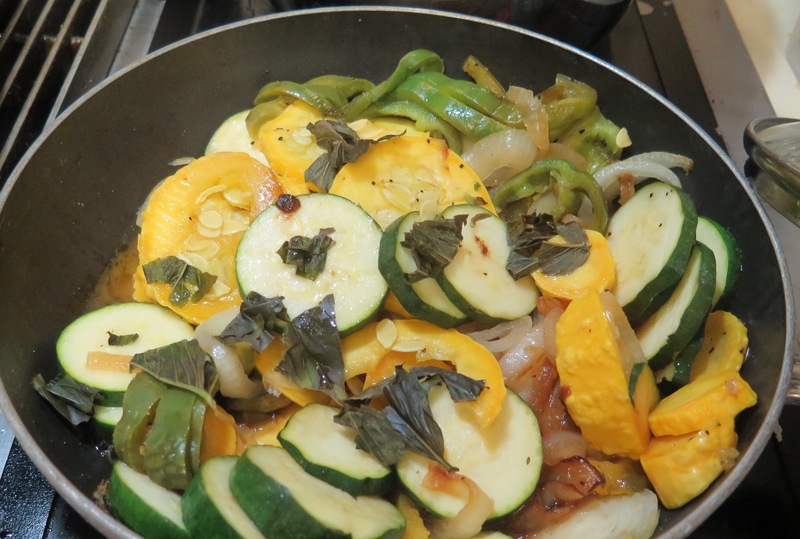 Then add the squash, lower temperature and cook until tender adding other ingredients as directed. Both these stir fry recipes are quick to prepare; you just need a skillet–no other pots or pans. And the recipes are adaptable to what you have on hand, diced red pepper makes an colorful addition. Saute onion, garlic and margarine in large skillet over medium heat for 5 minutes. Add squash. Cover and cook for about 5 minutes. Uncover and add green pepper. Cook over low heat, turning occasionally with spatula, until squash it fork tender, about 5 more minutes. Stir in seasonings, herbs and vinegar. Here is the second recipe using honey and white wine mustard. Thinly slice squash and cut onions into separate rings. Saute onions in margarine for 3 to 4 minutes. Add the squash and saute for 5 additional minutes. Combine the salt (optional), pepper, sage (optional), basil, honey, mustard and warm water. Add to squash Cook until done. Best if squash is not overcooked; still slightly firm. Both these recipes are great ways to get some vegetables into meals. Surprise your family! 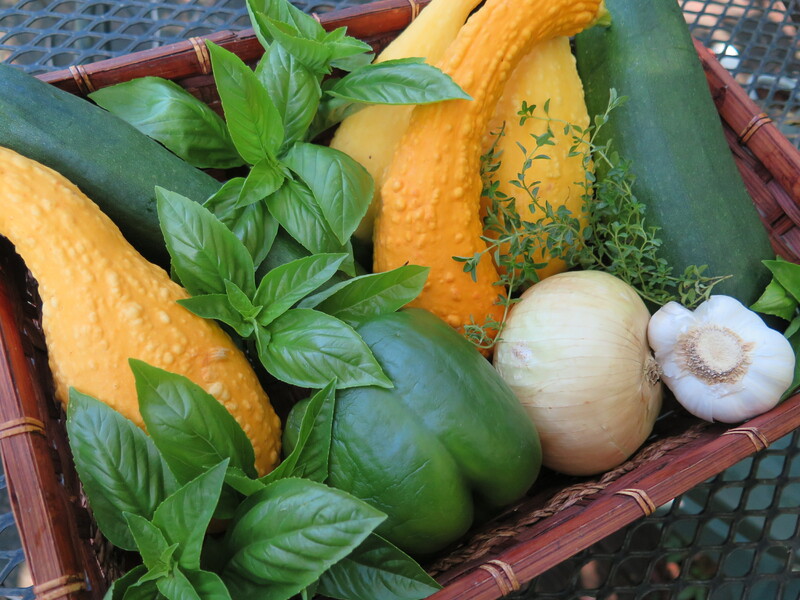 This entry was posted in Louisiana garden, Recipes and tagged Louisiana garden, recipes with basil, summer squash, summer squash zucchini and basil medley, using local produce by Maylee at Beyond Gumbo. Bookmark the permalink.